Exam Questions and solutions, videos, activities and worksheets that are suitable for A Level Maths to help students solve problems that involves the roots of a quadratic equation and the discriminant. 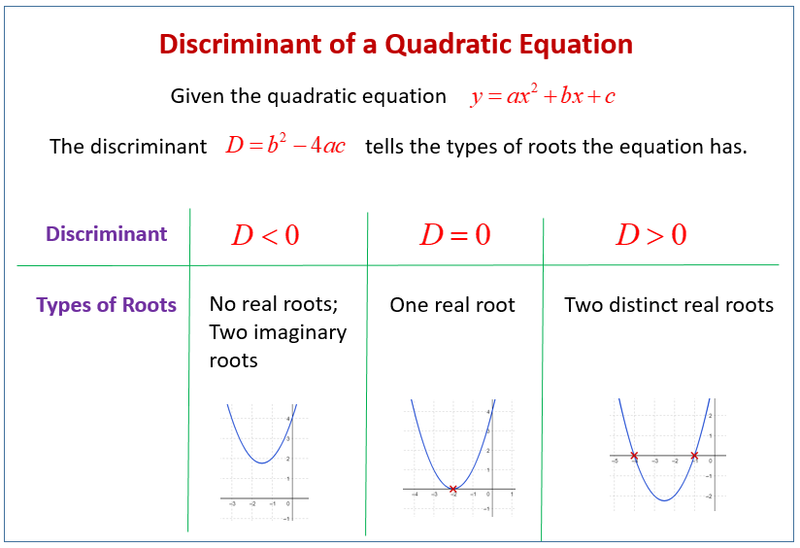 The following diagram shows how to use the discriminant of a quadratic equation to tell what types of roots for the equation. Scroll down the page for more examples and solutions on how to use the discriminant. This is the worked solution to question 8 from the Edexcel C1 (Core maths) paper for June 2008. The question is on the roots of a quadratic equation and the discriminant. Worked solution to the above core 1 question on roots of a quadratic equation. Uses discriminant.